Set in 65 acres, the Foxlease estate is operated by Girlguiding UK as a training and activity centre. An extensive complex, it offers camping and self-catering accommodation, conference facilities, a heated swimming pool and a range of equipment suitable for use in outdoor activities and events. Although Foxlease’s history stretches back to Domesday, the Foxlease Guiding story starts in 1912 when the house was purchased by Mrs. Anne Saunderson, nee Archbold, daughter of an American oil baron. A militant feminist and committed supporter of the suffragette movement, Mrs. Saunderson was a lady of strong social conscience. She became interested in the educational philosophy of Maria Montessori, and soon after purchase of the estate, employed a teacher trained in the Montessori Method of education, and opened a kindergarten at Foxlease, attended by 15 local children. Following the end of the First World War, during which many military personnel enjoyed Foxlease hospitality, Mrs. Saunderson heard Lady Baden-Powell talk about the newly formed Girl Guide Association. Filled with enthusiasm, and not a person to delay, she immediately set up and organised the 1st Lyndhurst Guide Company, became District Commissioner of the New Forest Guides, and welcomed many groups of Guides to camp in the grounds of Foxlease. 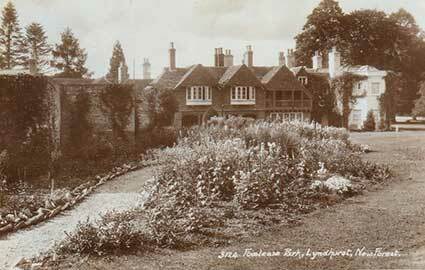 But in 1919, following the deterioration of her marriage, Mrs. Saunderson left Foxlease for good, bound for America. Although camping in the grounds continued, the house remained empty until on 28th February 1922 it was donated to the Guide movement. That day was the wedding day of H.R.H. Princess Mary, President of the Guide Movement, and the donation was recorded as ‘in honour of the occasion of the marriage of our beloved President’. Ever since, Foxlease has been the Hampshire home of Guiding. Illustrious visitors have included Lord and Lady Baden-Powell, Princess Mary, Princess Margaret and the Countess of Wessex. World Camps have been held at Foxlease, and thousands of guides from many nations have enjoyed the special ‘Foxlease fellowship’ and amenities.